OHA+M (Ontario Heritage Act and more): For Hamilton's Gore it's crunch time! For Hamilton's Gore it's crunch time! ***FINAL UPDATE: In late November 2017 the developers announced that they would not need to raze the two buildings at 24 & 28 King Street East after all — and would instead preserve ALL of the facades of the four buildings. 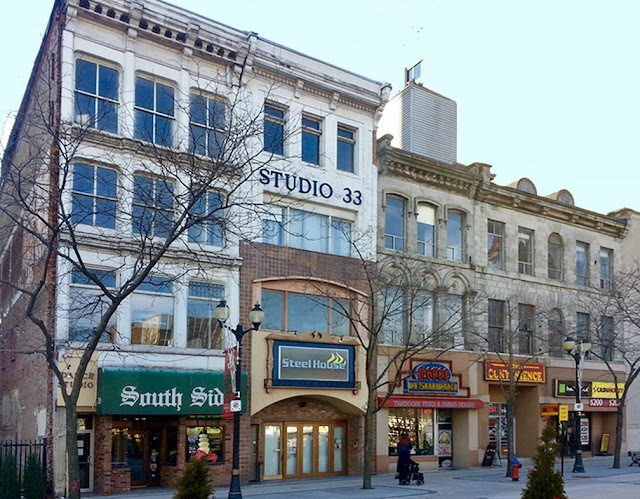 See "Two more facades to be preserved on historic Gore Park buildings: developer". Kudos to the developers for the major course correction. And kudos to the Friends of the Gore for their passionate advocacy for the Gore Park structures, which was recognized with an Architectural Conservancy Ontario award in October. The (wonderful) end of the story? Here's hoping! **UPDATE 1: Hamilton Planning Committee met on January 17, 2017 and approved the two heritage permits needed for the redevelopment project to proceed: to retain the facade of 18-22 King Street East and to demolish the neighbouring buildings at 24 & 28. City council gave final approval on January 25. Unbuilt Hamilton, which opened at The Art Gallery of Hamilton during the National Trust for Canada’s conference in that city last fall, is a fascinating exhibition about big building, planning and other projects in Hamilton that were never realized. . Among these is a 1983 proposal for redevelopment of Gore Park. The project, intended to “improve” the park, was begun by the city — only to be undone a month before completion in response to a flood of negative public reaction to tampering with a beloved public space. Is something like this unfolding on Gore Park today? Gore Park is a small park in downtown Hamilton. As the names suggests, the configuration of the surrounding streets gives the park, and the larger public sphere they define — known simply as the Gore — a distinctive wedge shape, oriented west-east. The Gore is in many ways the heart of Hamilton. Its street walls, composed of mainly nineteenth century commercial buildings with some more recent infill, enclose a unique urban space. It is a historic place of which Hamiltonians have always been justly proud, as the story from Unbuilt Hamilton illustrates. After a long decline the Gore, like adjacent areas in the city’s core, is ripe for rejuvenation. And, like them, its special character is under threat. The present threat is from a proposal for redevelopment of several old run-down buildings on the south side of the Gore, at 18 to 28 King Street East. The proposal basically calls for the demolition of all four buildings — with the facades of two of the buildings retained — to make way for a multi-storey structure. The accompanying images tell the tale. How did Hamilton wind up with an awful proposal for the Gore like this? In 2013 the National Trust for Canada put the four King Street buildings on its infamous list of the Top 10 Endangered Places in the country. This was after the owner of the property, Wilson-Blanchard Management, a condo management firm, applied for a demolition permit, which the city issued for the then-unprotected structures in December 2012. There was no proposal for what would replace them. After a public outcry, which included appeals to the province to intervene, the city finally took charge in December 2013 by issuing a notice of intention to designate, the first step in designating the buildings under the Ontario Heritage Act. This move had the effect of voiding outstanding demolition permits while requiring city council’s consent for any demolition or alteration of the properties pending the completion of the designation. The city was also prepared to offer the owner a considerable sweetener: a total of about $1.1 million in grants for restoration/conservation work on the buildings. In response to the notice of intention, however, the owner filed an objection, which triggered referral to the provincial Conservation Review Board. But the CRB’s process — a public hearing followed by a report/recommendation back to the city with council making a final decision on the designation — has been put on hold to give the city and the owner time to come to some agreement on redevelopment of the properties and protection of heritage features. In the spring of last year the owner unveiled the current proposal. Years go by and the result is no better than this? At this point, with the designation of the properties still up in the air, the owner — wanting to clear the way for its project — has applied for approvals for the demolition of two of the buildings (24 and 28 King Street East, the two later Victorian structures) and the substantial alteration/facade retention of the other two (18-22 King Street East, the Georgian-style structures, designed by no less than William Thomas, one of Canada’s most renowned early architects). City staff are actually recommending approval of the applications, on the basis that the applications are “consistent with Council’s direction for redevelopment of the subject properties” and would “implement” that direction. Really? This is puzzling, since there has been no public direction from Hamilton city council on acceptable redevelopment of the properties. It comes scarily close to staff saying: We’re recommending it because we've been told it’s what you want to hear. Faced with staff support for the owner’s proposal, the Hamilton Municipal Heritage Committee considered the applications on December 15. 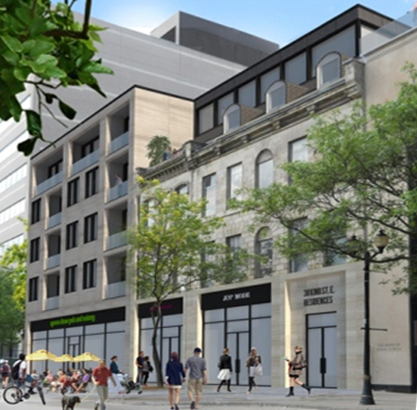 The committee voted to recommend rejection of the demolition application for 24 and 28 King Street East but approval of the alteration application for 18-22 King Street East. The matter now goes before the city’s Planning Committee on January 17 and full Council on January 25. The boarded-up Gore Park buildings, while structurally sound, have been left vacant and moldering for four years. Hamilton city councillors will surely feel it is time for a solution to the eyesore on the Gore. They may be tempted to think that the current (now slightly revised) proposal for the buildings is a good or at least passable compromise. They should think again. An acceptable compromise is a middle-ground that gives all parties much if not all of what they want. In a planning scenario it balances, or better yet reconciles, competing policy interests. 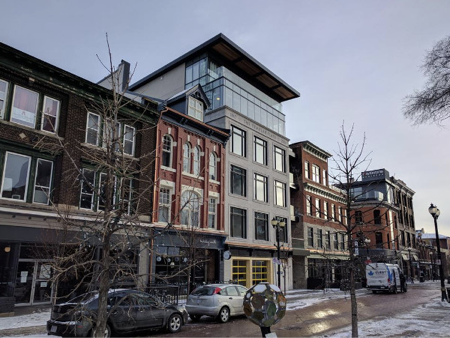 In downtown Hamilton there are some great examples of projects that respond to provincial and city (Official Plan) policies that require heritage building protection, encourage intensification and promote downtown rejuvenation. There’s the Lister Block, of course. Ten years ago it was a blot on the landscape and its fate hung in the balance; today it’s a showpiece and symbol of a resurgent city. But just down King William Street the Templar Flats is an even more recent — and more relevant — example. A case where the new development integrates the old, respectfully, within a larger, character-defining streetscape. I think a big part of the problem here is our penchant for focussing on parts or pieces, at the expense of the bigger picture — specific heritage elements rather than the entire exterior, exteriors or facades rather than the building as a whole, individual buildings rather than the surviving row of four buildings, the row rather than the King Street streetscape and the Gore as a whole. 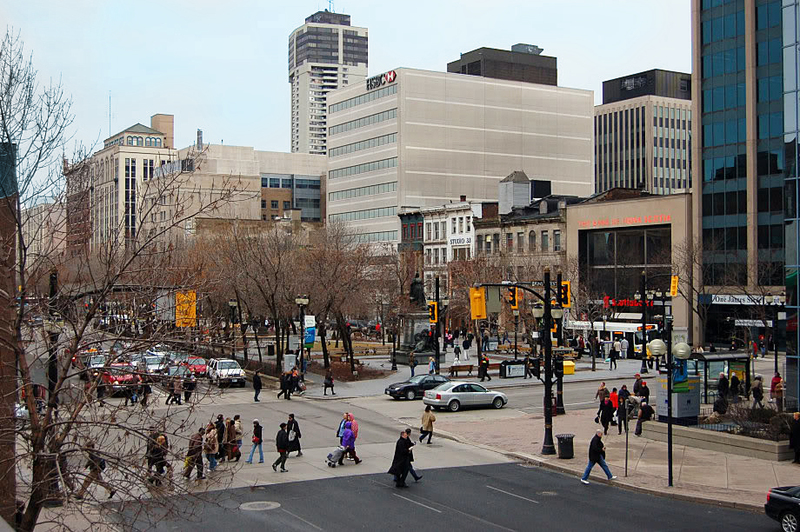 What is it we experience when we walk around Gore Park? The whole (space) is so much better than the sum… Relationship and context is key. 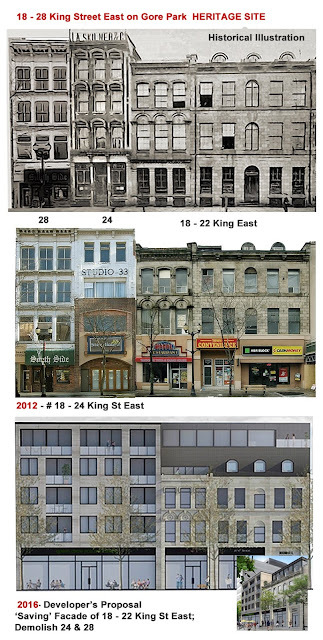 The city’s designation notice for the Gore buildings speaks sagely of the four buildings as “integral components of the King Street East streetscape and the character of the Gore area.” Despite this, the planning to date has been about picking these buildings apart and rationalizing which bits are disposable. Hamilton council is in the driver’s seat here. Drawing on its predecessor’s experience with Gore Park, it should stick to its Gore heritage designations and reject the major and irrevocable changes proposed. While the city should welcome and support the redevelopment of properties in the Gore, the current proposal is simply not good enough. Too much gets lost. A good proposal, like those successful examples nearby, would be more respectful of the Gore’s distinctive character. Above all city council should listen not just to professional experts but to the voices of its volunteer communities, its neighbourhood groups, its citizens. This is the lesson from the 1983 fiasco. Note 1: The exhibition and book of the same name are by Hamilton native Mark Osbaldeston. The exhibitions continues until February 12. Note 3: The city would have been smart to pursue the matter before the CRB and have done with it. Based on its track record, there can be little doubt the Board would have supported the city’s designations and in any case the city makes the final decision. Instead the city showed weakness by dragging the matter out and handing the owner a bargaining chip (agreement to the designations). It’s clear that, while the owner’s lawyer/architect’s information presentation at the General Issues Committee may have called for the “retention” (i.e. facade retention) of 18-22 and the “redevelopment” (i.e. demolition) of 24-28, the Committee and Council itself were not endorsing this approach, merely directing staff to review the matter and develop a process for moving ahead with its consideration by the city. 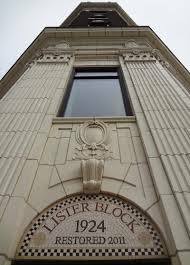 Note 5: Full disclosure: As a representative of the provincial culture ministry, I was a member of the Lister Block Working Group. Note 6: There is a parallel here with a stretch of Yonge Street in Toronto and what the city is attempting to do there. The city is studying the street for potential designation of a heritage conservation district. In the interim it has designated the area as a heritage conservation study area under section 40.1 of the Ontario Heritage Act. This puts a hold on development for one year.